​A moon is an object that orbits a planet. If you look into the night sky from Earth, you will nearly always see a beautiful glowing object that dominates the sky. This is the Earth's moon. The moon is our closest neighbour in space and our only natural satellite. The moon is made of three layers of rock. This includes a crust, which is about 60 kilometres deep, a mantle about 8000 kilometres deep, and a very thick core. The moon is held in constant orbit by the strong hold of the Earth's gravity. The closest distance that it comes to the Earth during its orbit is about 356 000 km. It takes approximately 27 days to complete one entire orbit around the Earth. This period is called a lunar month. As well as orbiting the Earth, the Moon also spins on its own axis. It spins around once on its axis approximately every 720 hours. The speed that it spins on its axis is exactly the speed at which it orbits the Earth. This means that one side of the moon is always turned away from us. The side turned away from us is often referred to as its dark side. The moon is a relatively large object. It measures about 3456 km in diameter, which is a little over a quarter of the diameter of the Earth. Our moon is very large in proportion to the planet that it orbits. The moons of other planets tend to be considerably smaller than the planets they circle. It may be easier to visualise the size of the moon by comparing it to something we know here on Earth. The surface area of the moon is similar in size to the continent of Africa. The sight of the Earth from the surface of the moon is awe-inspiring. The Earth appears four times larger and about 60 times brighter than the moon appears from here on Earth. ​It remains a mystery as to how the moon was formed. Scientists have always been particularly curious about its formation because of its unusually large size compared to the planet Earth. There are two popular theories as to how it was formed. Millions of years ago, when the Earth was first created, it is possible that another huge body, about the size of Earth, collided with the Earth. When this happened, material from the unknown body and material from the Earth may have been flung into space, forming one body, known as the moon. This could explain why the moon's outer layers are similar to the Earth's, but the inner layers are different. Another theory also suggests that another planet may have collided with ours. The collision possibly caused a great deal of debris to be spread out in space. Over a period of time, this debris may have been clumped back together due to gravitational pull. The moon may have formed by this re-clumping of debris. What are conditions like on the moon? The moon is the only other world that humans have ever set foot on. Astronauts have been able to gain first-hand knowledge of this fascinating place. A trip to the moon, however, is an extremely dangerous, expensive and time-consuming venture. Not only is the journey extremely long and dangerous but the conditions on the moon are very different from those we are used to here on Earth. Conditions are so different on the moon that astronauts must wear carefully designed spacesuits in order to survive. Space suits are necessary because there is no air or atmosphere on the moon, which means no oxygen for breathing. There is also no water, which means life cannot be sustained there. In addition to this, temperatures on the moon are extreme. 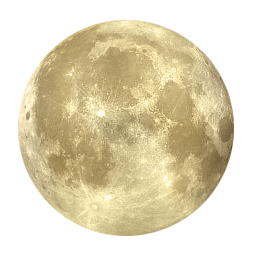 The moon's surface can be as hot as 110 degrees Celsius, which is hotter than the temperature at which water boils. At night, the temperature can drop to -170 degrees Celsius, which is much colder than the freezing point of water. Another interesting difference between the Earth and the moon is that the moon has much less gravitational force than the Earth. In fact, the moon has only17 percent of the Earth's gravity. This means that if humans were able to survive on the moon, they would weigh six times less on the moon than they would on Earth. You may have seen images of astronauts walking on the moon or floating around inside spacecraft. This occurs because the gravitational pull is not enough to allow a person to stand upright, with feet firmly weighted to the ground. On the actual surface of the moon, this lack of gravity means that an astronaut would be able to jump six times higher than they would on Earth. What a wonderful feeling to feel so weightless! What does the surface of the moon look like? The surface of the moon resembles a dry, dusty desert. It has areas of rocky plains that were created by lava that welled from deep below the surface millions of years ago. There are also mountains made of ancient rocks that run between these plains. Many years ago, when little was known about the moon, it was thought that the dusty plains were actually seas of water. This is because, from a distance, the plains appear as dark areas on the surface of the moon. These areas are still sometimes referred to as 'seas' even though we now know they do not contain water. Most of these dark areas exist on the side of the moon that always faces Earth. In contrast to these dark areas, the mountains made of rock appear as bright areas from a distance. The surface of the moon is covered with craters of all sizes. These create a scarring effect over the entire moon. A crater is a hollowed-out land formation that is caused by either one of two things. Some craters are caused by the impact of meteorites (large rock structures) that once smashed into the moon's surface. The impact leaves a deep hole on the surface where it hits. It also disturbs boulders and other debris which fall back to the surface, creating smaller craters. The white dust scattered over the surface of the moon is believed to be tiny splinters caused by meteor collisions. Other craters are formed by volcanic action. This occurs when a part of the moon's surface is forced upwards by molten rock and gases from within the moon. Gas and lava then spurts into the sky above. After these eruptions, the pressure underneath the surface eases and the moon's surface collapses. Craters are left in the places where the surface collapses. With all these craters and barren land formations, it is possible to see patterns on the surface of the moon. Even with the naked eye, we can see shadows and bright spots on the moon's surface. You may have, at some time, thought that you could see a face in the moon. It is these dark and light patches of the seas and mountains that lead to the popular childhood concept of 'the man in the moon'. Does the surface of the moon change? ​Unlike the Earth's surface which changes by the hour, the surface of the moon remains exactly the same over millions and millions of years. This is because of the total lack of movement and weather conditions on the moon. The only change to the moon's surface happens when a meteorite smashes into it and creates new craters. It is amazing to think that a footprint planted on the moon back in 1969 by an Apollo astronaut still remains perfectly preserved today! With no wind, rain or movement on the moon's surface, the footprint will probably remain the same for many millions of years to come.